Honey, why are your hands so dry and scratchy?, she asked. Might have something to do with using this about two hundred times this week. So a few hours after burning the prints off one finger (don’t grab for the heat gun without looking Greg!) the last lamps and pumps were connected and it was time for the moment of wiring truth. But first we needed juice. A visit to the Winglet (travel trailer you saw here two months back) to borrow the battery and it’s ready to throw the main switch. And just like that, 50 or so hours of wiring paid off. 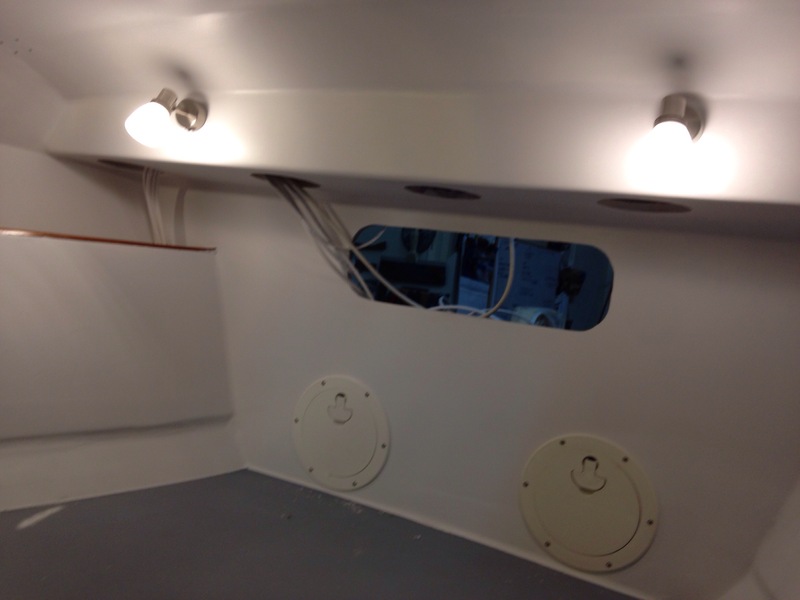 Everything works as it should, including the two ‘big ticket’ items currently installed, the refrigerator and the windlass. We’ll detail those with more pictures soon. It was very satisfying to stand in the cockpit by the remote switch and make the windlass go up and down! The boat is coming to life. 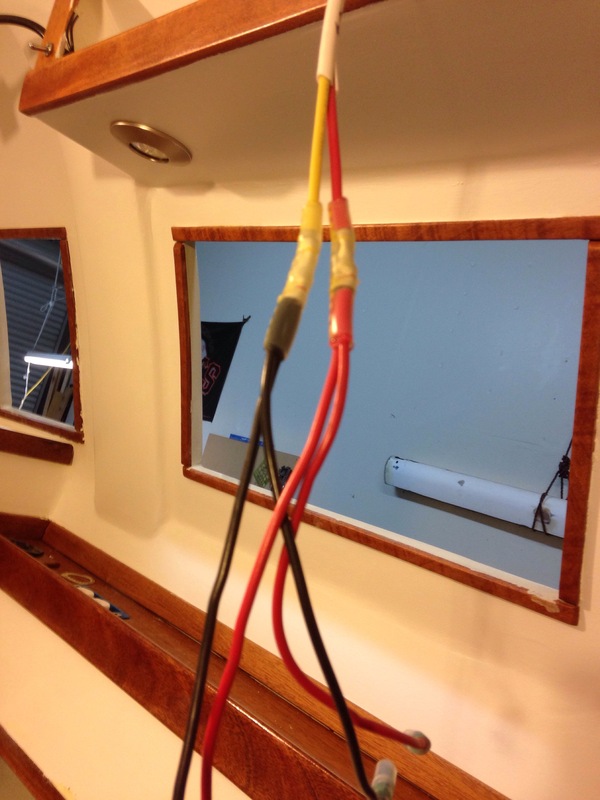 The wiring plan includes AWG 2 size conductor for the battery-to-panel runs and the windlass circuit. There’s a 100amp fuse between the battery and the panel. 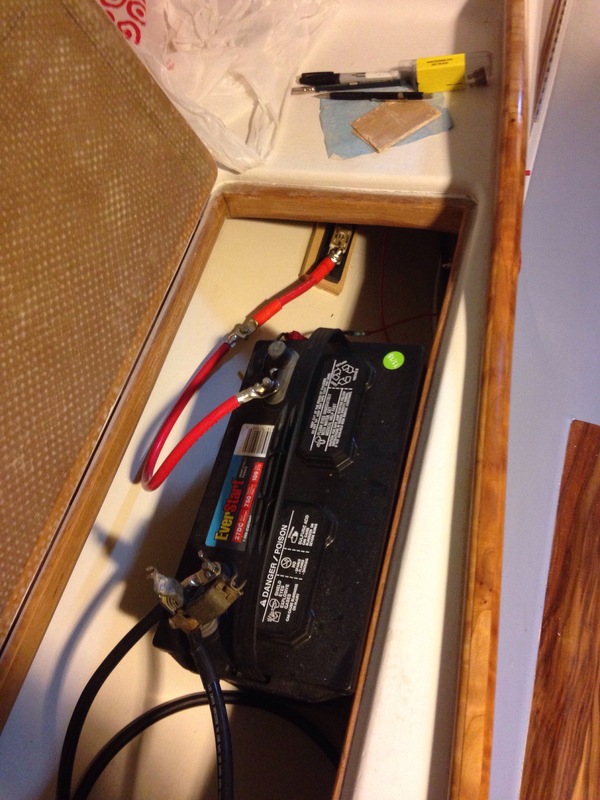 The windlass has its own 70amp breaker and a direct cable to the battery switch. 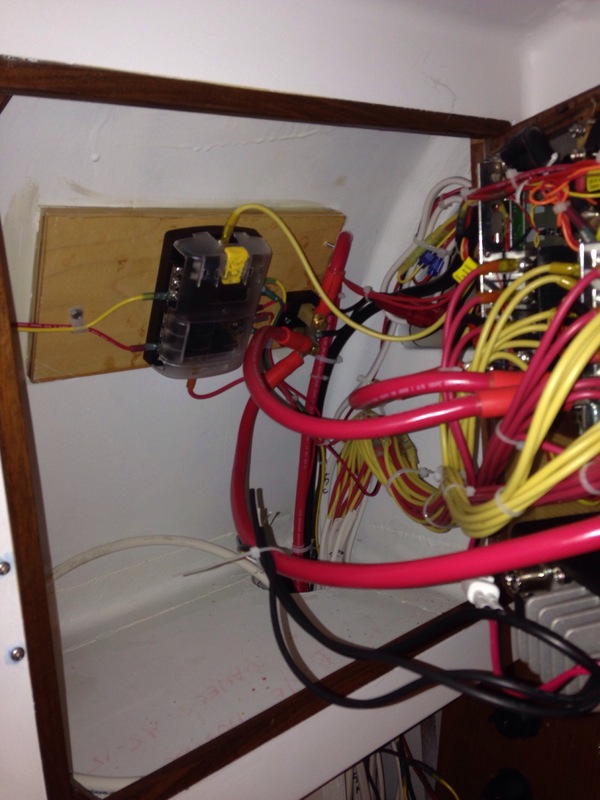 All of the branch circuits from the panel, plus the direct-to-battery bilge pump circuit, are AWG 12. That’s a bit of overkill for some of the lower draw circuits but overall it’s safer and was easier to pull everything from one 500′ roll. There’s about a dozen feet left (the very rough calcs did the trick). 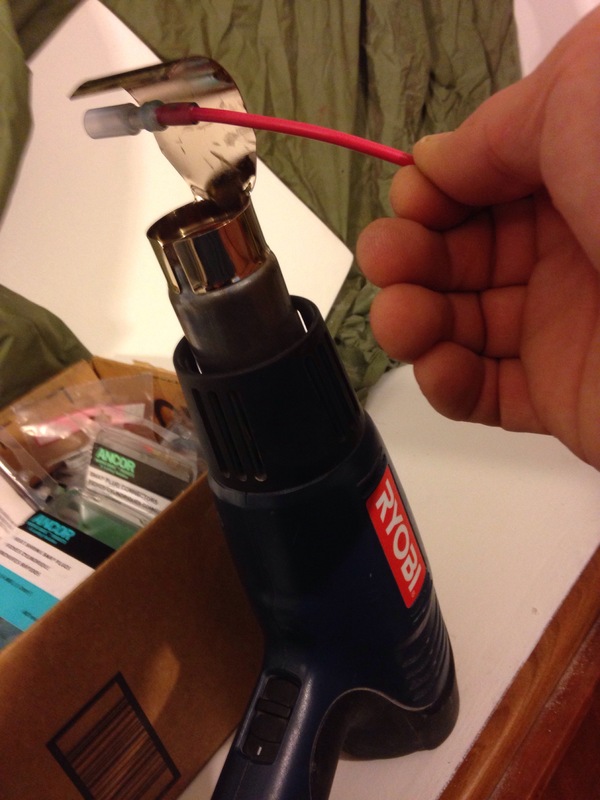 The 12/2 cable presented a challenge, as most terminals for stringing small lights etc. don’t deal with that big wire. 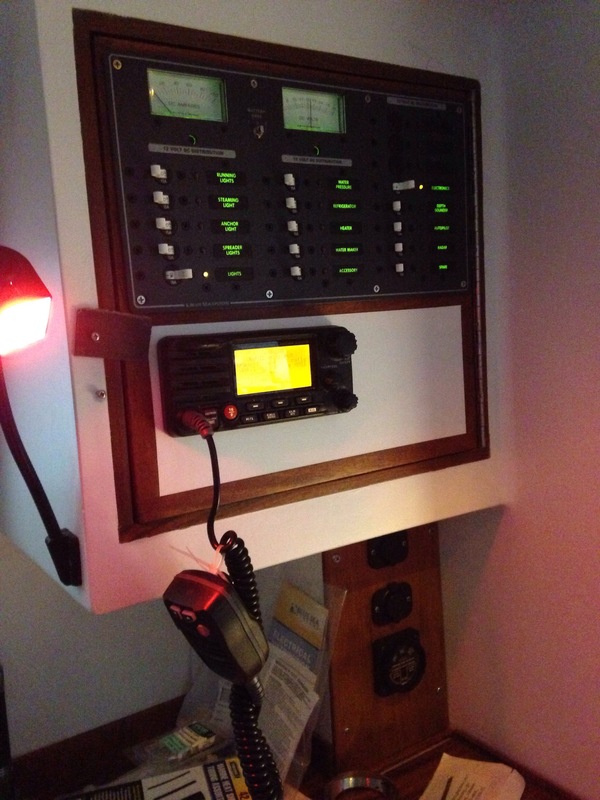 A new item in the Ancor electrics line became the mainstay of the lighting system. 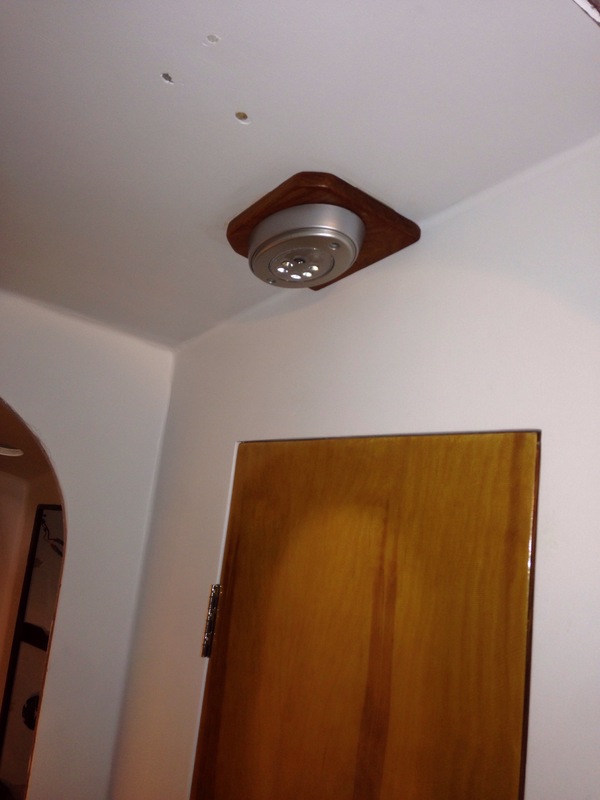 They are sized for one input wire and a pair out, so these allow pigtails, or highway off ramps, down to individual light fixtures. 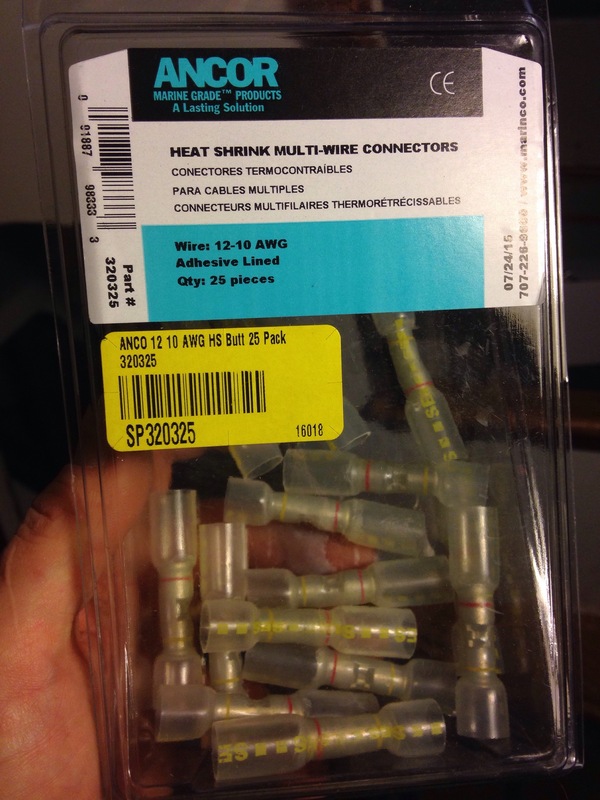 Not cheap at about $1.75 each, but it seems bulletproof for a long time. And for Cap’t Holway, I am eager to show you how EVERY wire on the boat is easily traceable and accessible beyond covers and dedicated chases. 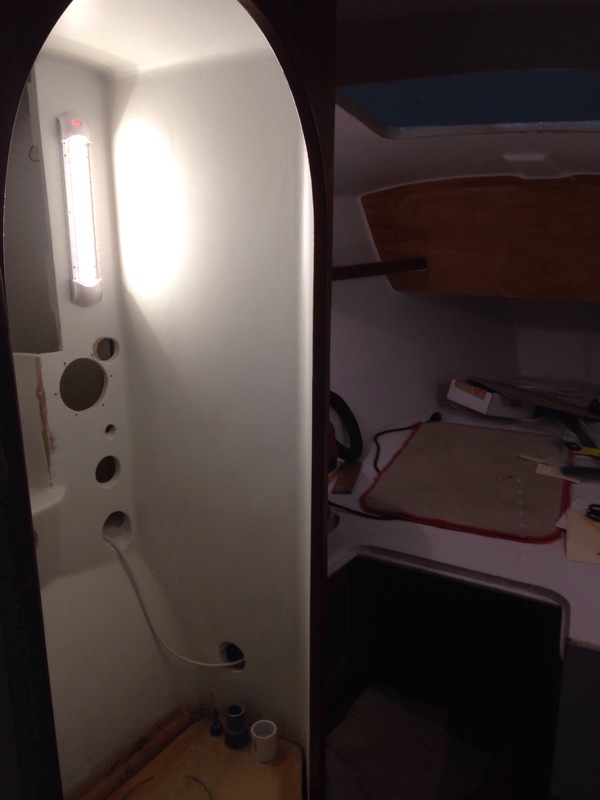 Some people don’t like the LED lighting for a boat. But low power consumption, less generation worry and less battery weight is the goal for sailing fast. 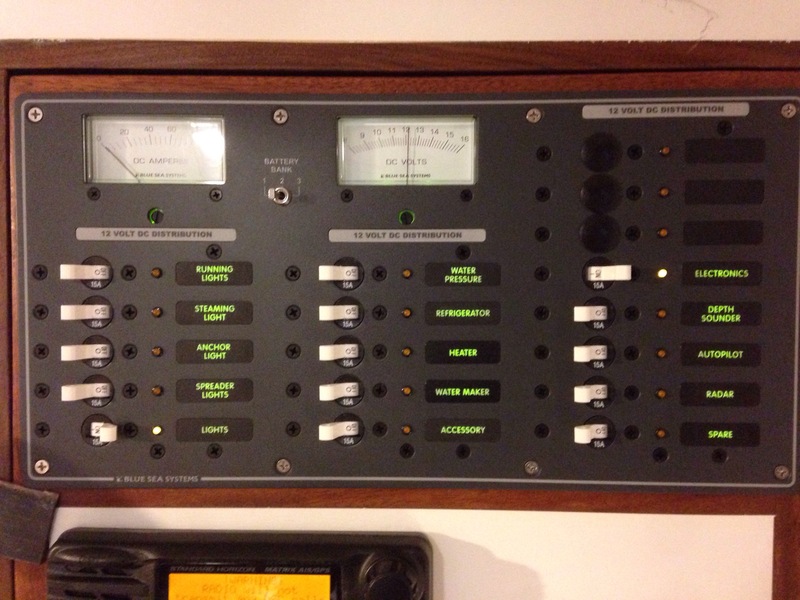 Tonight we switched on a bunch of the LEDs plus the radio – look at the ammeter in the panel barely registering an amp. A very good start! Best wishes for dry skies and crisp breeze to all our friends in tomorrow’s Three Bridge Fiasco. Looks like America’s biggest sailboat race has hit another entries high this year. Have fun guys! 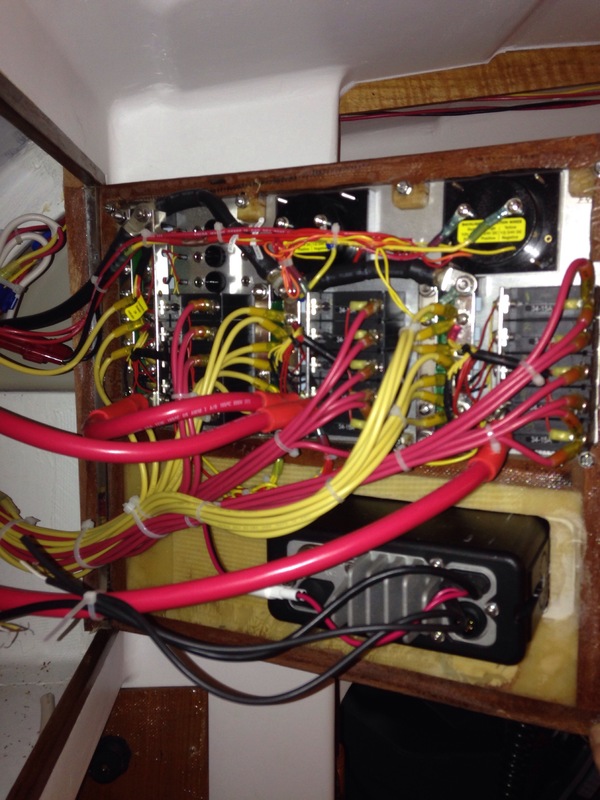 This entry was posted in electrical by cartersboat. Bookmark the permalink. Looking good Greg! Lots of work shown in those pictures. Can’t wait to see her in the water! THAT is funny! I’ll have you and your pop aboard very soon now.